ABOVE: The Generator Hostel, a.k.a. 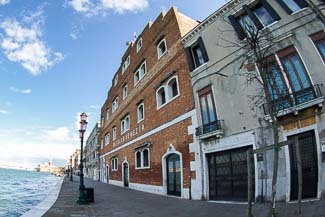 the Ostello Venezia, is on the island of Giudecca. This stylish design-themed hostel in a renovated grain warehouse is a bargain (except for the waterbus fare), and our directions make it easy to reach. This campground is on the mainland, to the south of Mestre and Marghera. It offers campsites, hookups, cabins, caravans, a restaurant-pizzeria, a laundromat, and more. You can leave your car and take the No. 16 boat from the campground to central Venice in 15 minutes. Convenience is a big selling point for this campground near the A4 motorway in Marghera, where frequent buses run to Venice's Piazzale Roma from a stop nearby. Facilities include mobile homes, bungalows, RV connections, a grocery store, and a bar-restaurant. This campground near the Punta Sabbioni ferry landing has bungalows for non-camping families who want a resort vacation on a budget.